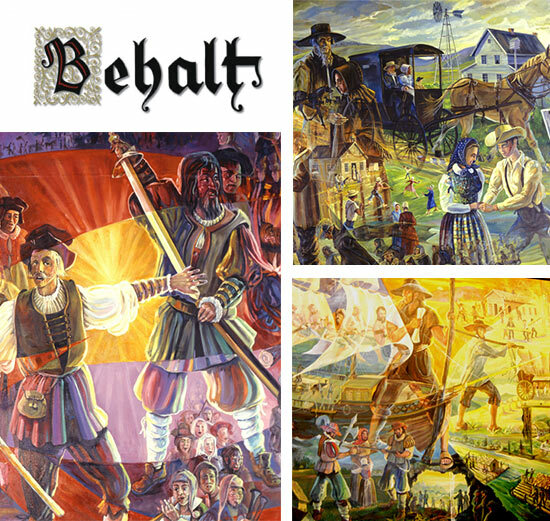 Behalt, meaning “to keep” or “to remember,” is a 10 ft tall x 265 ft long cyclorama, or mural-in-the-round. Behalt illustrates the heritage of the Amish and Mennonite people from their Anabaptist beginnings in Zürich, Switzerland in 1525 to the present day. The story is told within the development of the early Christian church, the acceptance of Christianity by the Roman Empire under Constantine, and the growth of Roman Catholicism. Following the depiction of the first documented adult baptisms in modern times in Zürich in 1525, the cyclorama continues to follow the spread of the Anabaptist movement throughout the world. From this movement sprang the Mennonites, Amish and Hutterite people. Today the Anabaptist family of believers numbers more than 1.6 million living in 80 countries. At least 60 percent are African, Asian, or Latin American. One of only four cycloramas in North America, Behalt is distinguished as the work of solely one artist—from original research and conception to charcoal sketches and final oils-on-canvas production of this historic masterpiece. We welcome you to the largest Amish settlement in the world. The beautiful scenery, combined with old-fashioned hospitality, will provide an unforgettable experience that will keep you coming back for years.